1. 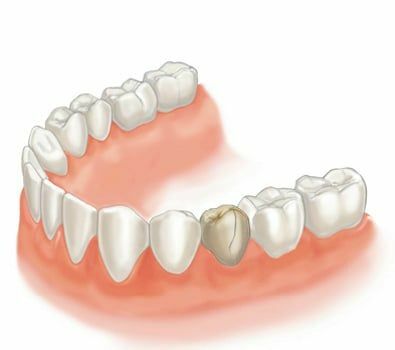 Composite Fillings - Natural tooth colored filling, bonds to the tooth to provide added security. 2. 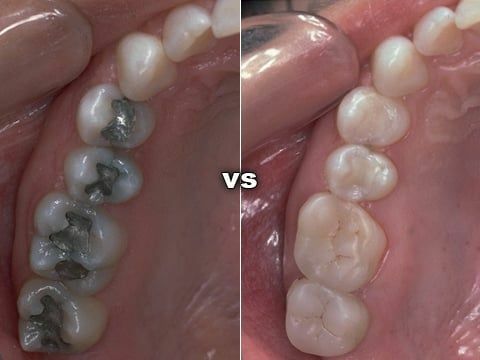 Silver Fillings - Inexpensive and strong amalgam based filling. 3. 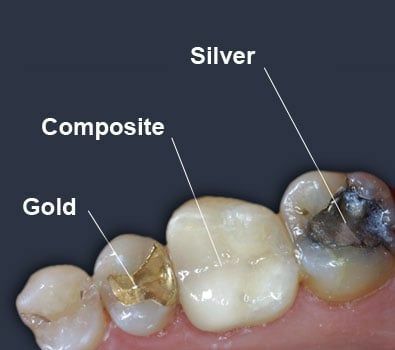 Gold Fillings - More attractive than silver and provide for a better fit. 4. Porcelain Fillings - Also called inlays; the most attractive and durable of the tooth colored choices. Dr. Rinck is a cosmetic dentist in San Rafael. Dr. Rinck offers proven technology that allows you to replace old silver and gold fillings with a more natural looking, composite filling. Composite fillings are bonded to the tooth and research has proven them to be about 90% as strong and healthy as natural tooth material. With todayâ€™s advances in dentistry, there are several options when choosing a type of crown. 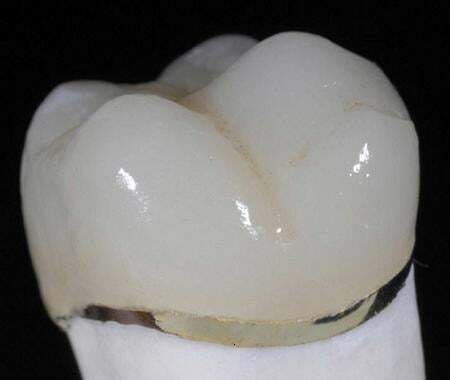 The most common crown utilized in dentistry is referred to as a PFM or porcelain-fused to metal crown. 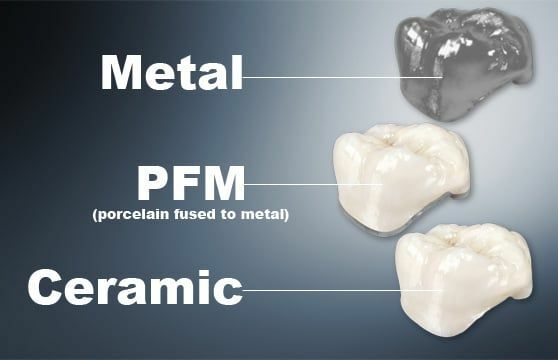 For those that have sensitivities to metals or are worried about aesthetics, there are all porcelain crowns or crowns that are composed of a material called composite. There have been several advances in all porcelain crowns and some labs are now utilizing zirconia which is much stronger than a typical porcelain crown. 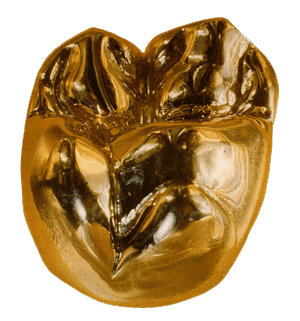 Also, they still are making all metal crowns, which are typically gold, and are usually used on a molar or a back tooth. Of course all of these different options vary in durability, appearance and cost. Please contact our office for any further questions. We would be more than happy to find the crown that is right for you and your situation. These are very esthetic, bonded crowns. They are mostly used for front teeth because they are the most natural looking type of crown and are often used in 'cosmetic' dentistry. There are many types, but they all have a common feature - no metal. They can occasionally break, but dental technology has advanced far enough to make them quite strong. When you come into our San Rafael, CA office and talk to Dr. Rinck, the doctor may feel that your best option to replace a single lost tooth is a bonded bridge. A bonded bridge consists of two parts. The first is a false tooth, called a pontic and the second are 'wings' that support the pontic. The entire structure spans the space vacated by the missing tooth giving you a natural looking replacement without damaging surrounding teeth. Neighboring tooth structures are allowed to remain the same and the wings of the bonded tooth are attached behind the neighboring teeth. So don't put off that dentist appointment one more day. Pick up the phone and call Dr. Rinck at 415 479-4977 and setup an appointment to replace that missing tooth today. You will be so glad you did. Neighboring tooth structure is removed shaping them to receive an anchor crown. An impression is then taken and sent to a dental lab where they fabricate the bridge.